This week I'm on a vacation with my parents in Rhode Island, exploring the wonderful old mansions of Newport and the beautiful sea treasures along the rocky beaches near our house. 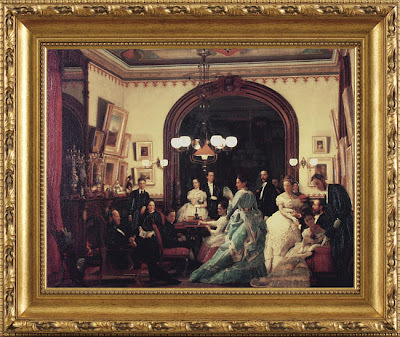 I saw these great paintings - one a reproduction, the other an original - at the Newport mansions I toured and thought you might like them, too. Sadly, this was the largest image that I could find of "Going to the Opera" - the dresses really were quite lovely when viewed in more detail. 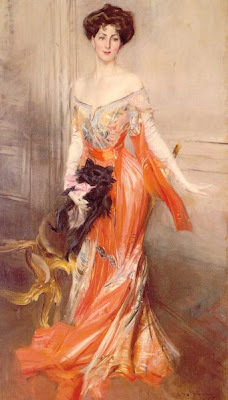 I love the movement of the fabric in Boldini's representation of Elizabeth Drexel Lehr. Isn't it great?